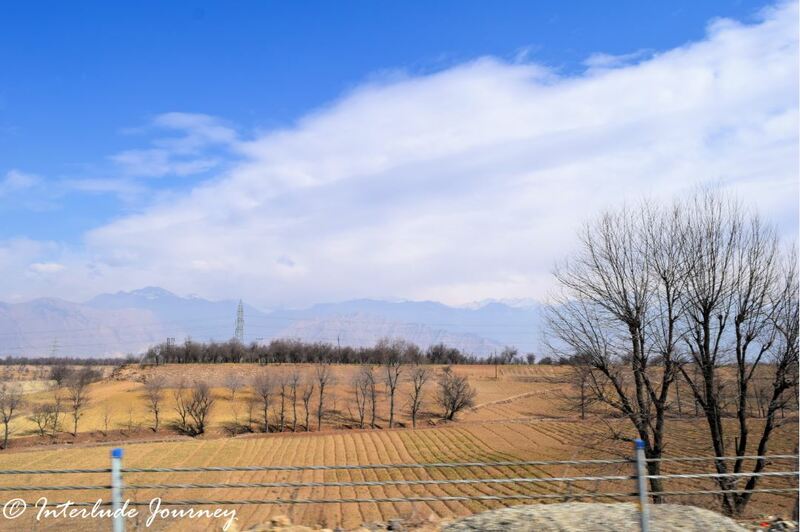 As we drive along the National Highway1 from Srinagar to Pahalgam in the state of Jammu and Kashmir of India, we see multiple contoured fields on either side of the road. During the months of October and November, the fields would be awash with purple hues of saffron spreading sweet fragrance throughout the region. Since the harvest season is long gone, there are no crops in the fields. The farmers are busy toiling in the fields preparing them for the next season.We are near a place named Pampore popular for growing the best quality saffron in India. All through our drive along the National Highway 1 ( which is now renamed as NH 44), we see soldiers and military vehicles on patrol. I wonder if all the security is for some VIP movement happening only to learn soon that the security is to ensure no agitations happen on the highway and to support the smooth movement of traffic. The highway is very crucial for Kashmir as it connects the valley to the rest of India. Within a few miles after passing Pampore, our car stops by the side of the road as other vehicles zip past us. A nondescript board near a garden gate by the side of the road reads that we are at Awantipura, a town which was once the capital of Kashmir valley. As documented in Rajatarangini, a historical chronicle of North-west India composed by Kalhana, the town of Awantipura was built by the King Awantivarman, the founder of Utpala dynasty which ruled the region of Kashmir during the 9th century. Awantivarman was a believer of Vaishnava Cult and hence got a grand temple constructed dedicated to Lord Vishnu. The diety was named as Lord Awantiswamin. To honor the request of his minister Sura who was a believer of Lord Shiva, Awantivarman also got a temple constructed for Awantishwara where the chief deity was Lord Shiva. The two grand temples which are now in ruins are located at a distance of 1km apart. 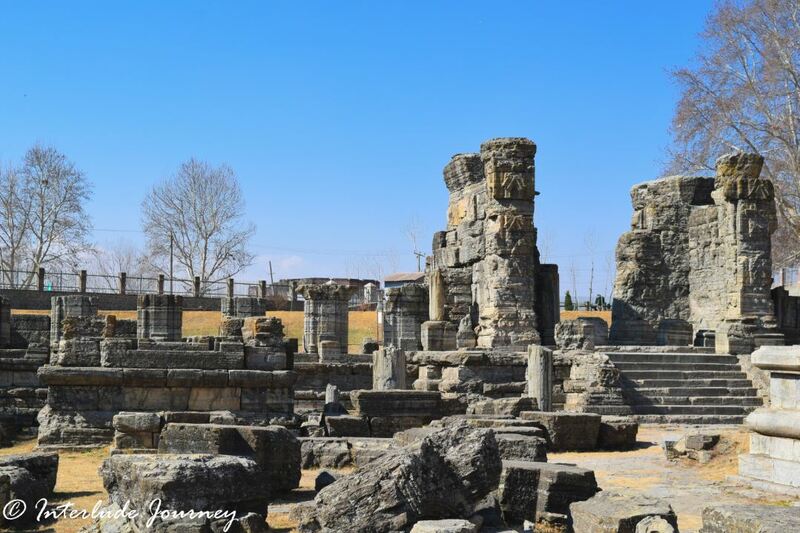 Both the temples were much below the ground level and were covered completely in silt from various lakes which once covered the valleys of Kashmir. The temples were discovered after they were excavated by the British archeologists in the year 1910. 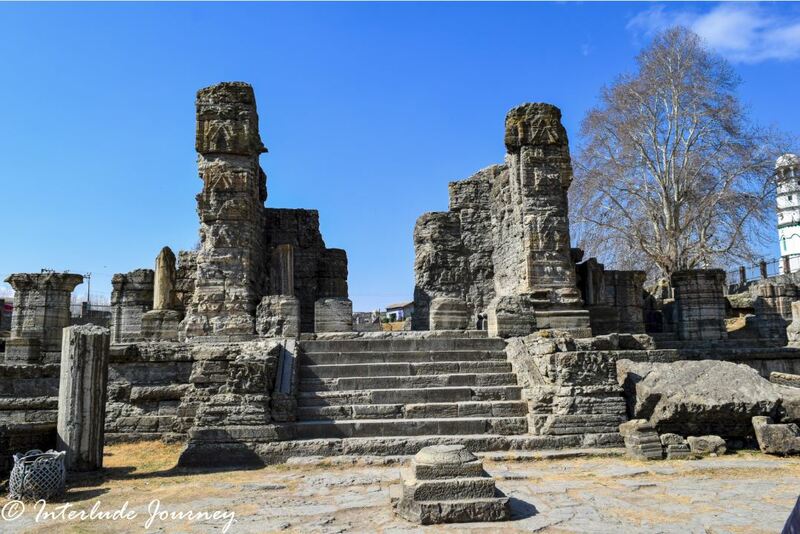 Awantipura remained a major pilgrim center for Hindus until Sultan Sikandar Butshikan, an Afghan ruler took over the reign of Kashmir. At the behest of an Islamic spiritual leader Syed Ali Hamadani, Sultan Sikandar engaged himself in a crusade and ended up in the massacre of Kashmiri people and destroying their holy places ruthlessly. Like many other temples, the temples of Awantipura were destroyed almost to rubbles. It is said that the construction of the temples was so strong that it took over a year to demolish them. The sky is almost clear except for a few puffs of clouds. The midday sun shines brightly above us. The lawn on either side of the pathway leading to the ruins would have been lush green had it been spring but the scene we see is quite the contrary. Along with rendering all the trees bare, the winter chills have also withered the grass to an unappealing brown. Though the temperature is well above 10-degree centigrade, the constant breeze makes it feel much colder. There are no visitors at the ruins as it is an off-peak season. Only a few pillars are visible from the road. As we got closer, we are introduced to the remains of the wonderful piece of architecture. An imposing pillared mandap with exquisite carvings stands high above the ground level as a gateway to the temple precinct. 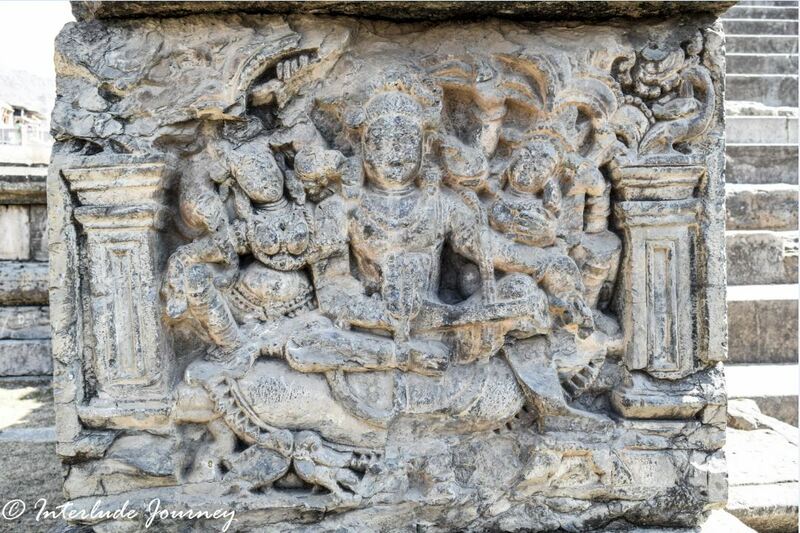 Most of the details in the carvings are destroyed during the brutal attack by the Islamic invaders. What remained has been weathered further in time. The main shrine of diety Awantiswamin stands in the center of an oblong courtyard. A running peristyle of pillars supporting the roof of an array of cells marks the precinct of the courtyard. Each of the cells could have housed beautiful idols in the past but all we see are a few pillars and broken beams.The remains of four smaller shrines stand in the four corners of the courtyard. 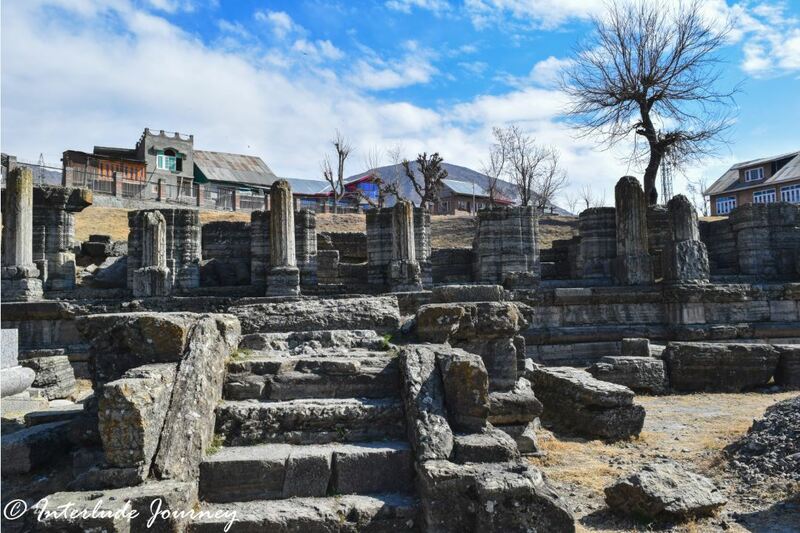 We are told by our guide that most of the idols that were excavated at the temple were transported to the museums in England and a few of them which remained are currently put on display in the SPS museum in Srinagar. Sauntering around the ruins, observing the pillars and pedestals, we notice many floral motifs with faded petals, disfigured demigods and mythical creatures with deformed toes and facial features. As we return to the cab to continue our onward journey to Pahalgam, we turn back one final time to take in the view of the rubbles which stand as vestiges of the past paradise. 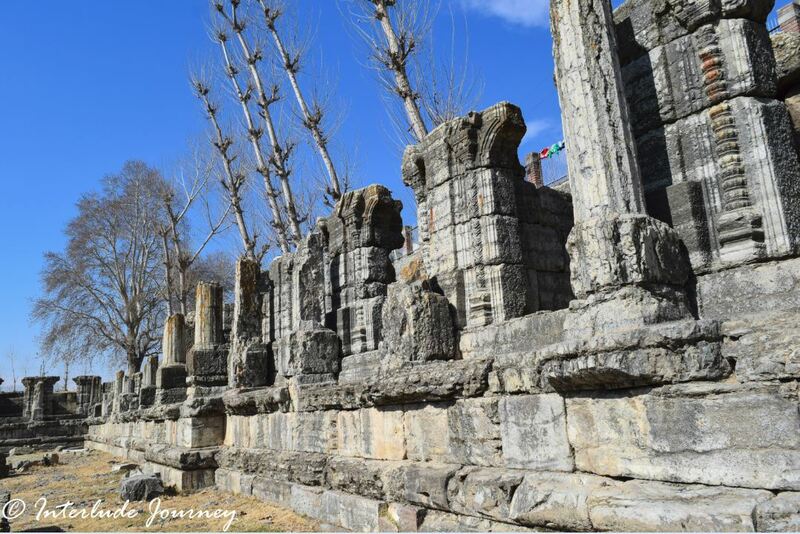 Awantipura is located at a distance of about 30km from Srinagar and is easily accessible by road. It can be easily covered on a day trip from Srinagar. Alternately, it can also be visited on the way to Anantnag or Pahalgam from Srinagar. The nearest airport is at Srinagar. The town also has a railway station. While Awantipura can be visited throughout the year, the best time to visit is post-monsoons during October-November months when the area is covered with lush greenery and the saffron fields near Pampore are in full blooms making it a wonderful sight to experience. To see the ruins topped with snow, plan your visit during the winter months between December and March. Great post. Never heard of this place before. Would like to visit on my visit to Kashmir next time. Is there any other important places nearby which can be included on the way? Thanks Jithin. Awantipura lies on the way to Pahalgam from Srinagar. We were told there is also a Gurudwara at Mattan which is nearby but could not make time to visit. If you visit during October/November, you can also visit Pampore which is famous for saffron cultivation. The history of Awantipira is really fascinating. These are one of the ruins which are not so prominently projected. But indeed they are another perspective of Kashmir. Would love to visit these ruins when we are in those parts. This is a lesser known part of Kashmir. I really enjoyed the historical references in your post. I’ll make sure to visit Awantipura whenever I make my way to Kashmir. I know I am missing a gem by not having yet visited Kashmir, and now I am looking closely at Awantipura, to visit the beautiful ruins. Looks captivating! Wonderful, Thanks for the post this! I love your photos in this post! Kashmir has been near the top of my list for a long, long time and you’ve just reinspired me! Thnks for sharing this. Had never heard about this place before. Great sharing about this hidden gem. Definitely a very valuable read for me. I will try to reach the spot on my next Kashmir visit!